Below is the 2018 season recap for the Oakland Raiders. 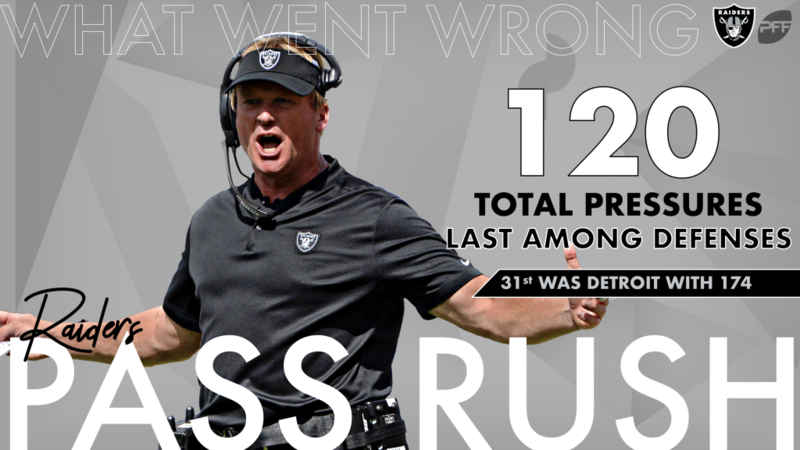 The second Jon Gruden era in Oakland got off to an interesting start, with the team being plunged firmly into rebuilding mode. However, there were signs of life for a team now flush with draft capital and spending money. Only a fifth-round draft pick largely due to a heart condition, rookie interior defender Maurice Hurst flashed at times with game grades of 70.0 or higher in five contests, including his 90.5 overall performance against the Browns. Center Rodney Hudson was again an all-star pass protector and has now surrendered just two sacks in four years. 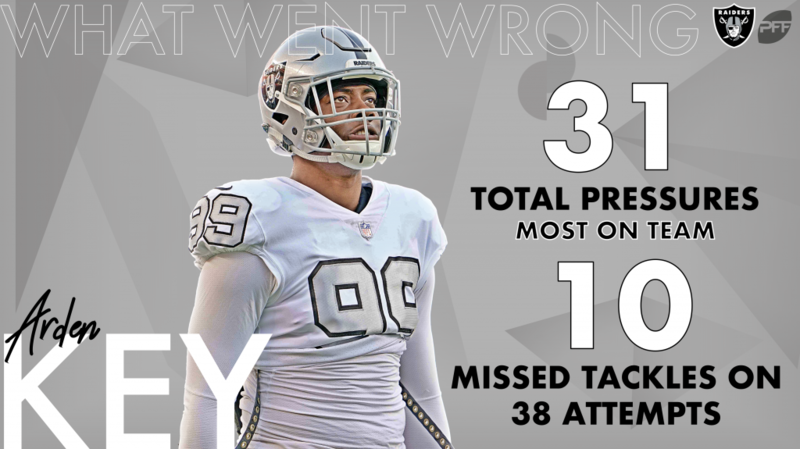 With Khalil Mack traded away, pass rush proved hard to find for the Raiders. Third-round rookie Arden Key was the only defensive player with more than 15 total pressures, a figure multiple SAFETIES in the league surpassed. Arden Key may have been the best pass rusher the team had, but he missed 10 of his total 38 tackle attempts this season. First-round pick Kolton Miller was a disaster after being asked to play through injury, having been merely below average when fully healthy. Once the team traded away Amari Cooper, their receiving weapons were entirely uninspiring. There were few bright spots on the Raiders’ offense, but Rodney Hudson was the lone member of the offensive line that looked like he belongs on one of the better units in the league. 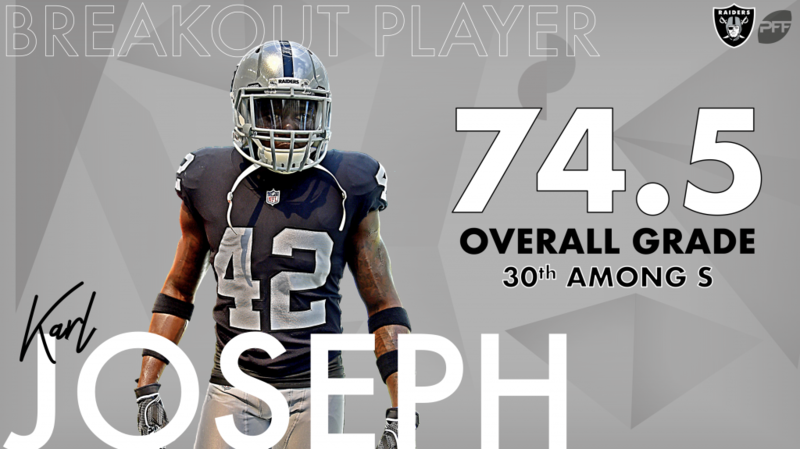 Safety Karl Joseph continued his development in year three as a pro, grading well in all facets of the game and earning a career-high overall PFF grade of 74.5. Karl Joseph was also Oakland’s breakout player, taking another step forward this season and posting a career-high in PFF coverage grade to go along with his overall mark. 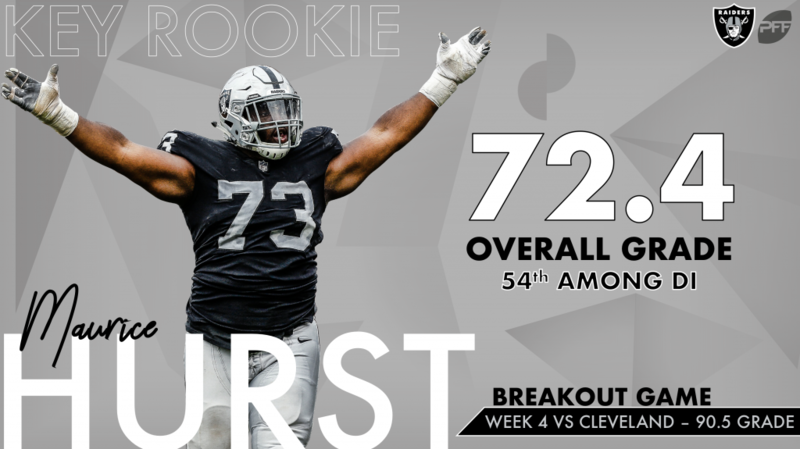 This was not a rookie class to remember in year one for the Raiders, but Maurice Hurst dramatically outperformed the expectation of a fifth-round pick, not to mention second-round pick P.J. Hall at the same position. Year one may have been something of a write-off for the Raiders in the new Jon Gruden era, but they have amassed significant draft capital and spending money to begin the rebuild in earnest, so enter an exciting offseason.